Cross Country Ski Machines offer efficient and effective aerobic exercise working large muscle groups. Users will quickly burn calories, have more control over their weight, and will simultaneously work both the upper and lower body for shorter workouts. The low impact and minimally resistant movement requires balance, coordinated upper and lower body movements, strength, and endurance creating a complex workout unparalleled by other machines. Cross Country Ski Machines can be installed side-by-side to allow for companion work-out sessions. The state of the art finishing process used on the Cross Country Skiing Machine combines the application of an 'Electrocoat Zinc Rich Primer' with a durable polyester powder-coat top layer to ensure every crevice and joint is completely sealed, providing full protection against	corrosion and weathering. 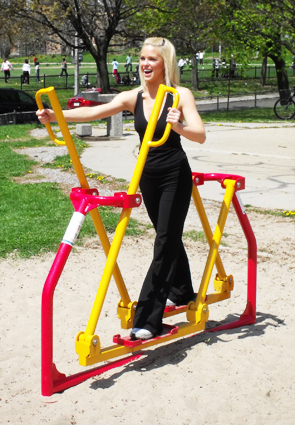 Cross Country Skiing Machines are finished in either a gloss or textured polyester powder-coat finish. Develops lower body including quadriceps, hamstrings, glutes, calves, lower back, and lower abs. Strengthens the heart and lowers blood pressure. Maintains bone density to help prevent osteoporosis. Low impact movement is light on joints and back.